A sweet, fragrant and a warm taste of cinnamon spice is gaining importance in today’s world where morbid conditions are at its peak. One of the oldest spice known, it is made from a bark of a tree and is used in sweet and savoury food preparations. Cinnamon comes in various forms such as cinnamon tea, cinnamon oil, cinnamon powder which can be used for therapeutic treatments as well to enhance the flavour. We all use this spice and enjoy its strong taste be it in food or in tea but, did you know what this spice can do for a healthy living? 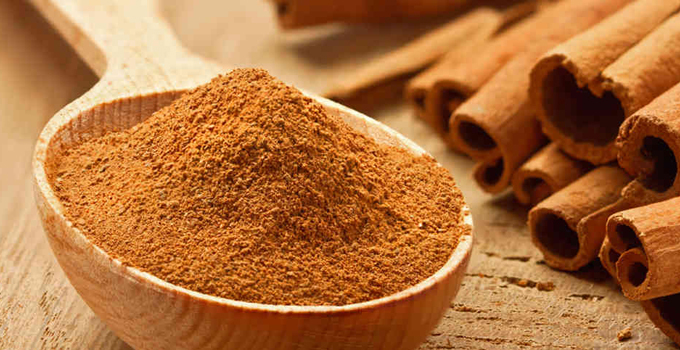 The most common and known effect of cinnamon is to stabilize the blood sugar! It is known to reduce the LDL cholesterol (bad) in the body. It has anti infectious properties which help in curing ulcers and also in irritable bowel syndrome. It is packed with manganese, calcium and iron. It is best known to be used during PMS (premenstrual syndrome) wherein the mood swings and cramps subside. Cinnamon acts as an anti-inflammatory. Add one to two teaspoons of ground cinnamon to a steaming hot cup of green tea. A dash or two of cinnamon added to soups such as lentil or black bean may add an exotic flavour, plus provide the warming goodness may bring relief to those feeling under the weather. So, next time don’t forget to add 1-2tsp of cinnamon powder to your cooking and wait to see the wonders!